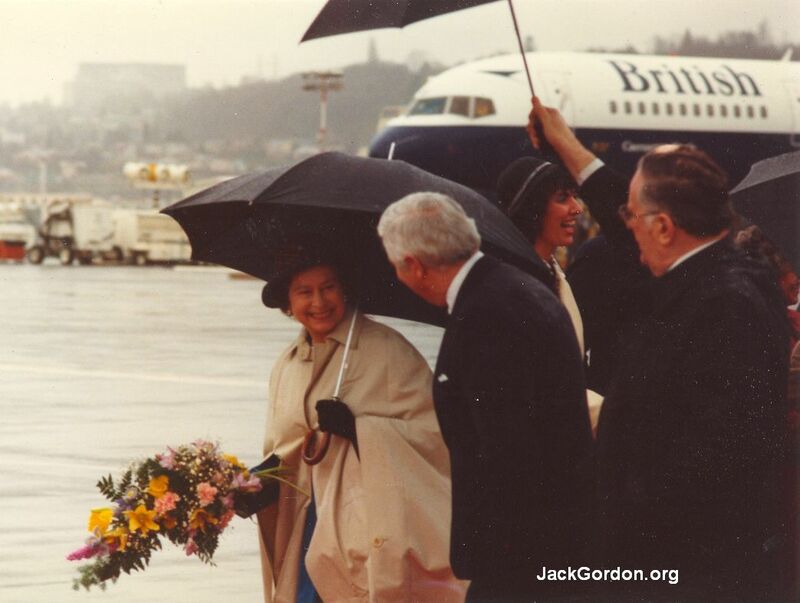 1983 Saw Jack serving as chairman of the Royal Visit by HRH Elizabeth II of Great Britain and her husband the prince. 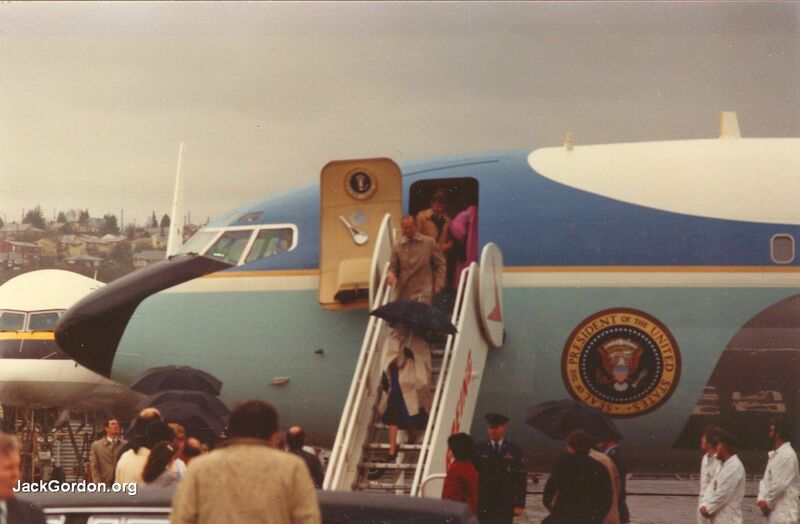 Here, the Queen and Prince Philip descend the stairs of Air Force One into a typically soggy Seattle day. Note that the Queen is carrying her own umbrella. 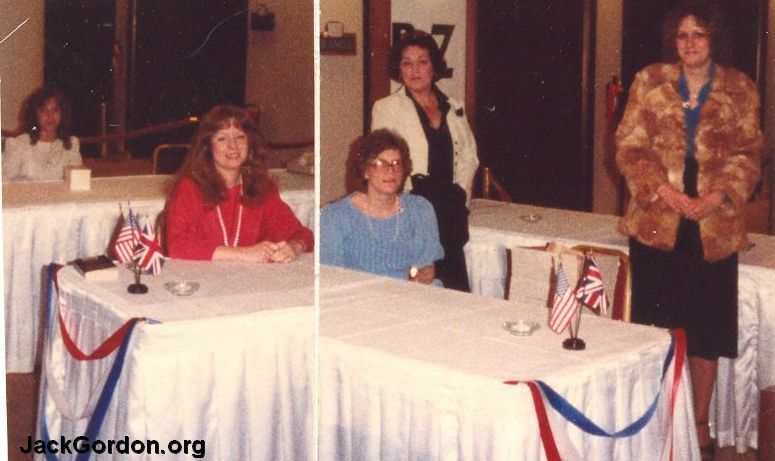 Here's a composite photo of the Restaurant Association staff who helped check people into the RoyalReception held at Seattle's Westin Hotel, later in the day. (l to r are) Tracy Alishio, Linda Macintosh, Mary Pederson, Carol Wright, and Debbie O'Connor. 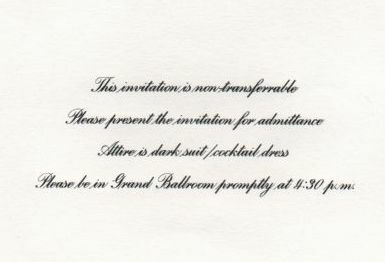 Here is one of the invitations that came from the office of Washington State's Governor Spellman. 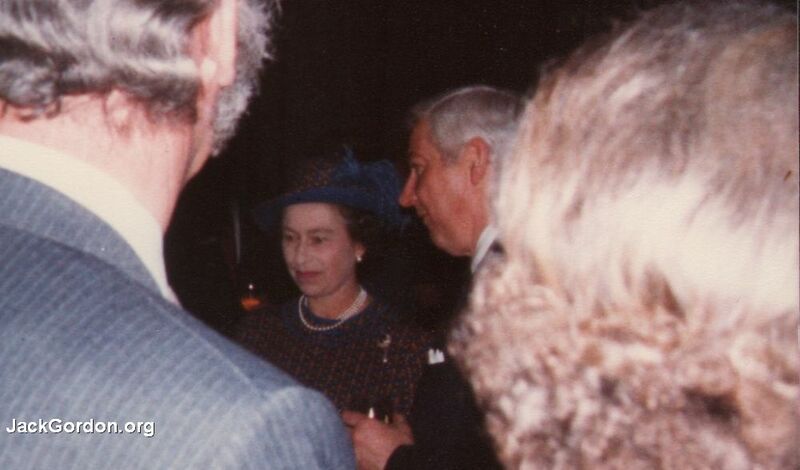 Washington Governor John Spellman escorting the Queen into the Reception at the Westin. 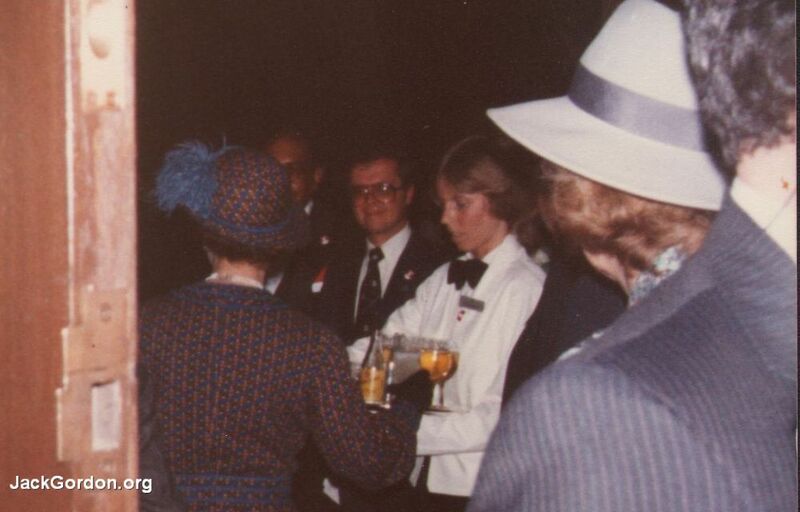 The Westin Seattle's Director of Catering Frits Gehner and an unknown waitress serve the Queen with a Washington wine. 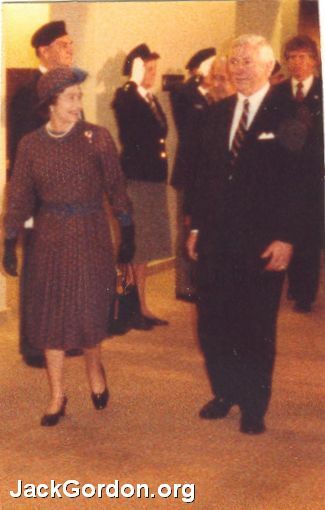 Queen Elizabeth II is introduced to a guest by Washington Governor John Spellman. 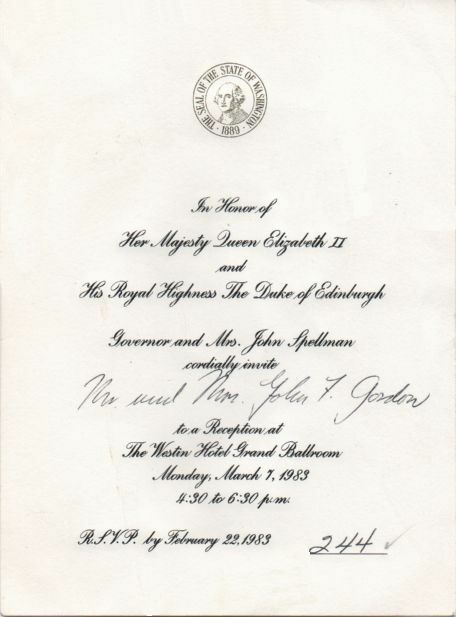 Following the reception at the Westin Hotel, a select number of Seattle area dignitaries -- including Jack Gordon -- were invited to meet privately with the Queen and Prince Philip aboard their royal yacht, Brittania. 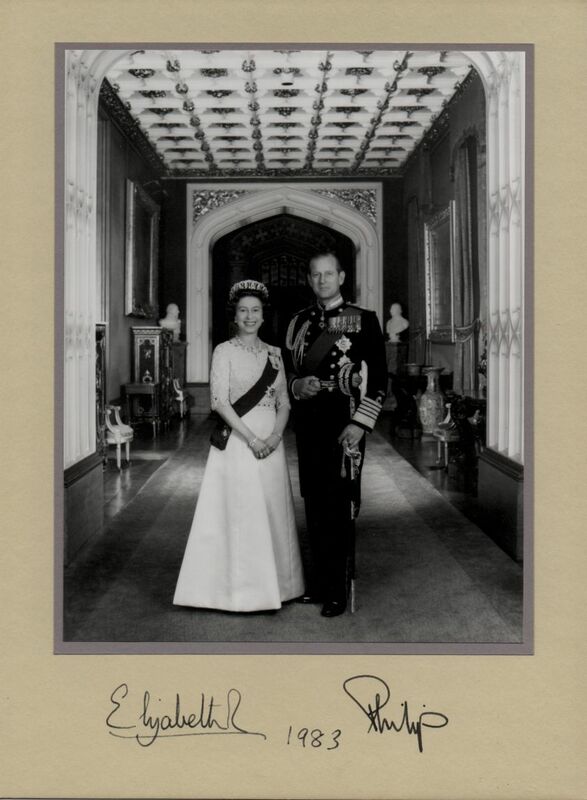 After the Queen personally thanked each, they were presented with an autographed photo of the Royal Couple.